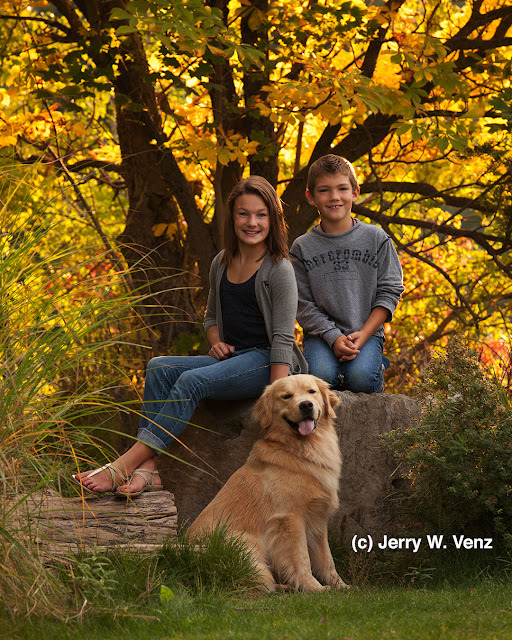 PHOTOGRAPH CHILDREN BY NATURAL LIGHT; THE BEST LIGHT MONEY CAN’T BUY! Just a little background for you, so you know who I am…I’ve been doing portraits of families and children in the studio ( http://www.TheStorytellersUsa.com ) and outdoors for over 25 years. As a PPA (Professional Photographers of America) Certified, Master, Craftsman I’m very comfortable and proficient—with many state, national and international awards—in both the studio, using professional flash systems and outside using TAILORED natural light. 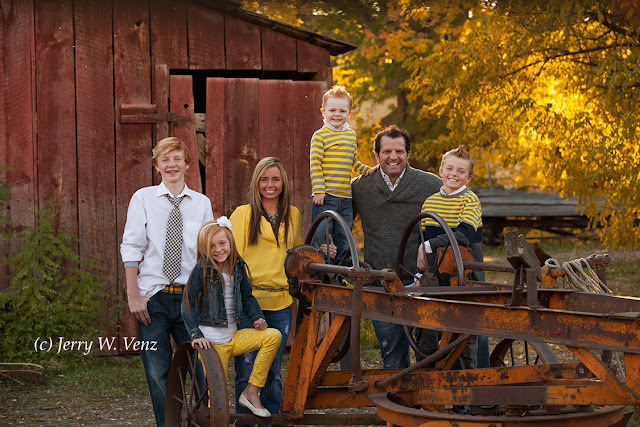 That being said, by far, my hands down preference is outdoor Natural Lighting for my children and family portraits. It’s not just that I prefer this type of lighting—my clients Love the Look of my style of outdoor lighting and they spend more money when they order. 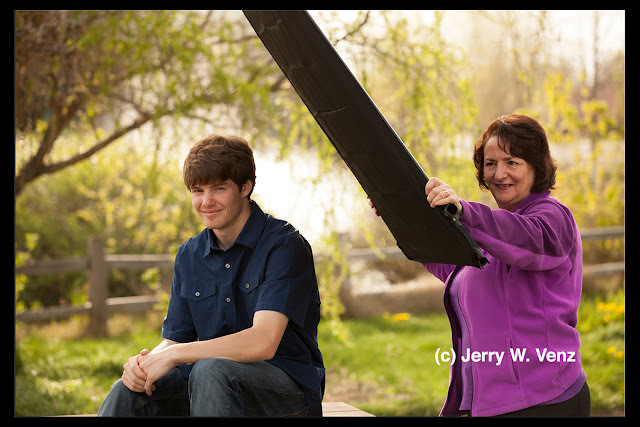 In fact, 90% of our wall portrait sales are from these sessions with an average of at least one 20”x24” portrait. So, what do I mean by “Tailored Natural Light”? I don’t just plop my subjects down in an open field (I’ve seen this from Many photographers!) and use that flat omni-directional light with a blown-out background. No; to get the results I want I must be in control of Where and When we do the session. I give our clients the choice of one of the eight locations that I know, on a month-by-month basis, when and where each spot is usable. Because children are so naturally alive, I want my backgrounds to be alive and glowing as well—if there’s no glow it’s a dead background and I won’t use it. That’s why I don’t use Black Backgrounds in the studio for children or families either, it’s too funeral like for my taste. This philosophy is so important to me that for any portrait session—studio or outdoors I start with the background. I tell my students that, “I build the portrait from the background…forward”! Light in the background from the setting sun 1 to 2 hours before sunset. Open shade for my subjects—direct sun shall not touch the mask of their faces. Clear open sky from ONE side of the location. Trees or bushes on the Opposite side; My Gobo. What the heck is a Gobo? It’s my light blocking device to create a shadow side on my subjects faces. This is how you create three dimensionality in a portrait. This is why there is no need for flash outside (while the sun is still above the horizon); there’s too much light and it’s often coming from multiple directions. 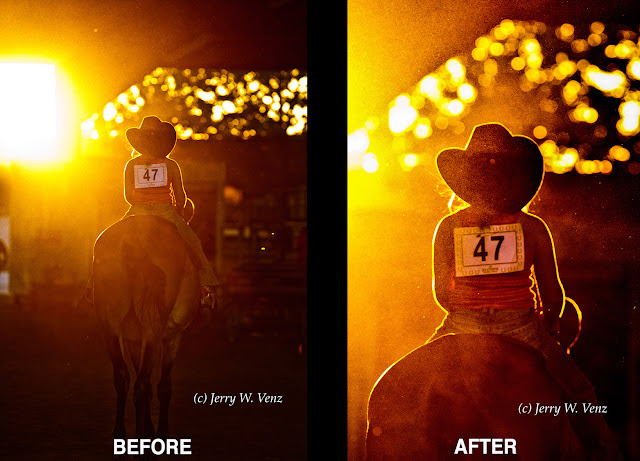 It’s much easier and you need to spend far less money on equipment to just subtract the unneeded light! My philosophy of lighting is that you should not introduce a point light source (a speed light) into an environment already lit by a very large soft source (the sky). They just don’t mix well. In my world the flashes live in the studio where they don’t have to compete with any other sources and I control every nuance of their output. The Sun is Never allowed in my view finder; the direct sun is no longer my light source, open sky light is now my source. The only time I allow direct sun to touch my subjects is maybe 15 to 30 minutes before sunset. My outside portraiture starts about 2 hours before sunset with my subjects in the shade. 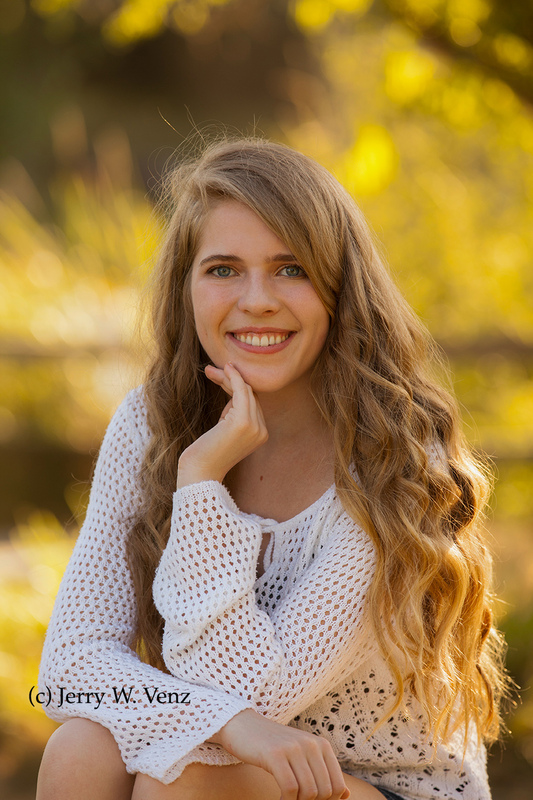 I use the most telephoto (the longest focal length) I can possibly use, when doing portraits, in conjunction with the widest aperture possible to create the depth-of-field I require. The example below is typical of my subject placement relative to the setting sun. You can see by the hair light on Dad, and the boys around him, that the sun is pointed towards my lens. It’s in fact, just out of frame and without additional shading my lens would be flaring badly. 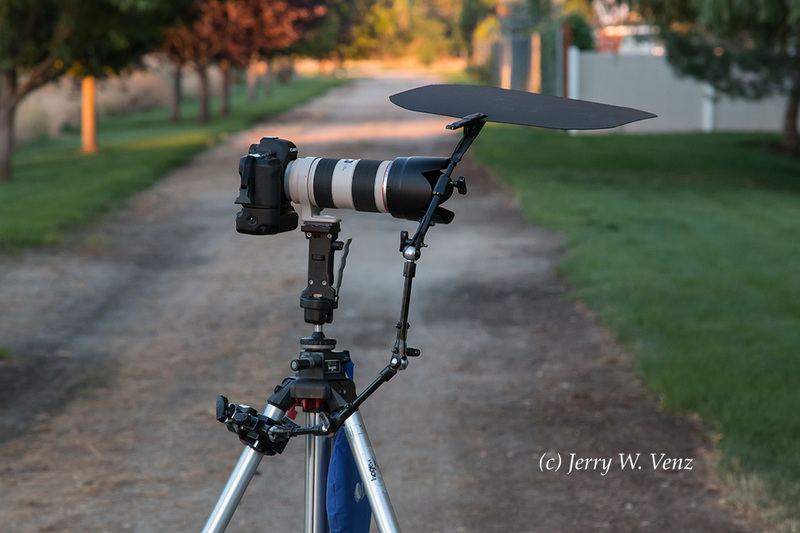 I’m using the Matthews Superflex Arm clamped to my tripod with their Mafer clamp. The “Flag” is simply a piece of black-core, Super Black, Matt Board. The reason I need this set-up is that the standard lens shades, especially the “flower-petal” types that are cut-away for use at wide focal lengths, are simply not enough when the sun is low and just out of frame. In my film days I used some after market bellows lens shades (Lindahl and Sailwind) that were great. They were extendable (you could even buy extensions to make they longer), so you could adjust them to suit the focal length you were using. I continued to use them when I went digital because the Nikon 80-200mm f2.8 lens I used had a very short lens shade. The Exception to No Direct Sun on People. As I said earlier the only situation where I allow direct sun on my subjects’ faces is that last warm light 15 to 30 minutes before true sunset—especially at the beach. The following image of a couple on the beach is a nice example of this type of light. It was done 30 minutes before true sunset. We would start our beach sessions about 1 1/2 hours before sunset starting at areas away from the beach. 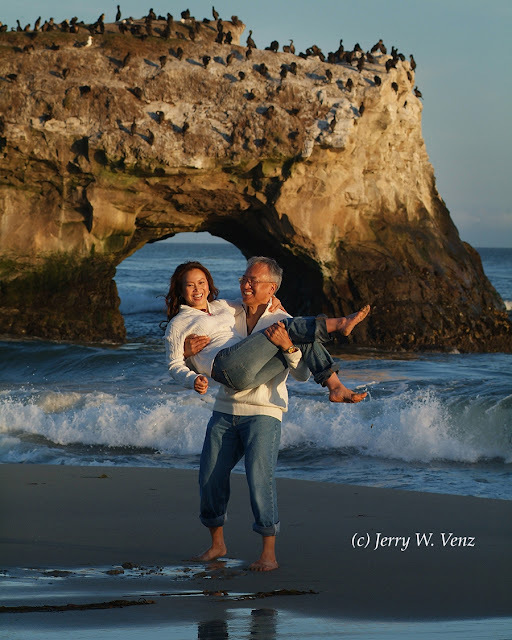 Then we work our way down to the beach and use that last 30 minutes of gorgeous light doing images of our subjects walking, playing and frolicking in the surf! Everybody gets wet (especially me) and we all have a great time on these sessions. As a professional photographer I need to be in control of my lighting in any situation whether outside using natural light or in the studio using flash. Backlight, especially when outside, is one of my trademarks in portrait photography—Flare is Not! Since I’m often pointing my lens towards the setting sun I go to great lengths in controlling lens flare. Why? Because even a small amount of flare reduces image density and contrast that weakens the subject. However, these days I see many photographers using so much lens flare that it actually obliterates all subject detail! In my opinion, the results usually just produce an unsellable, amateurish, product. People Not Looking at the Camera: This is storytelling or editorial photography, so this is where I use more backlight, maybe with some flare; a looser artistic approach. In this situation I use the standard lens shade on my 70-200mm lens and try to keep my lens at 200mm, most of the time, to crop out the light source. The basic rule here: Whether outside or in the studio it’s not a good idea to photograph your light source. If I can’t crop out the light source in camera I’ll frame the image so I can crop out the over exposed source in Photoshop later. 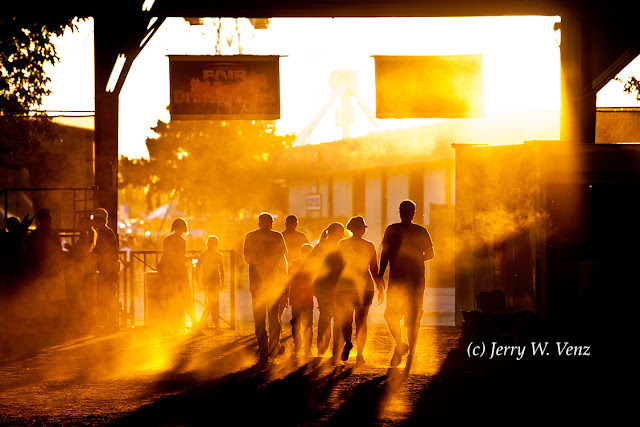 In the example below I zoomed out, relatively wide, to capture this great backlit scene of the people exiting a large livestock exhibit at the state faire. The backlight was enhanced by the dust they kicked-up as they walked through the barn’s dirt floor. Then I created this pano-like strip with a post capture crop. In the original un-cropped image you can see whey I say not to photography your light source! The full image on the left is being dominated by the sun at the expense of my subject. So, after doing everything I could to bring back subject density and contrast in ACR (with clarity, contrast,black point, exposure, and knocking down highlights) I then cropped in to remove my blown-out light source. I like the gritty quality that was enhanced by cropping in. The gritty backlight’s source was a combination of the dust in the air and the high ISO (1600) I had to use in the dim barn. Then all my adjustments in ACR added to the look. Stay tuned…Next week I’ll address people looking at the camera. Let me know if you have questions. 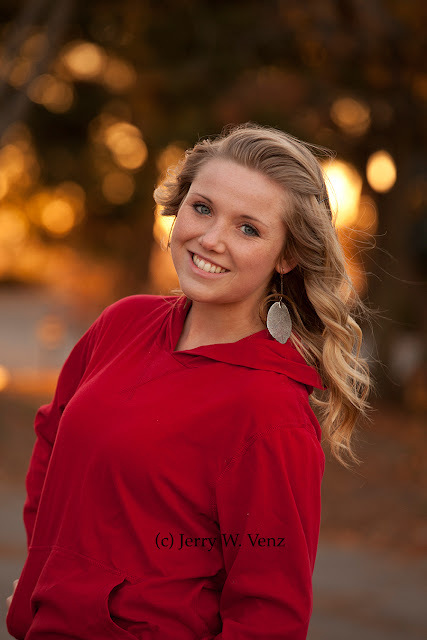 GETTING FALL COLORS PORTRAITS FROM FEBRUARY TO JUNE! 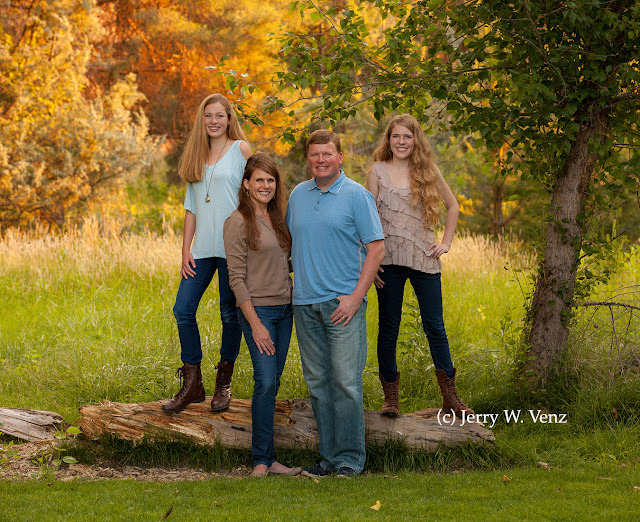 Our most requested, popular and profitable portrait sessions are the outdoor sessions in the fall. That’s great, but that season—September, October and November—is not enough to sustain a full time photography business. So, I learned, over twenty years ago, from several great Master Portrait Photographers, how to extend the fall season look. They taught me that it’s all about subject placement and time of day. As long as there are leaves on the trees I can create the look of fall colors in my backgrounds throughout much of the year. Even here in Idaho I’ve done this as early as February! Session Time of Day: BACKLIGHT is the key to creating a warm glow in the background caused by the setting sun shinning through green leaves. The later the session the warmer the glow. In early summer I can get a nice yellow glow, from green leaves, two-hours before sunset. In my February example below, I used some evergreen trees with strong backlight a half-hour before sunset. Note: If I don’t have that glow in the background I don’t use that location; at least not at that time. Backgrounds that have no light are Dead Backgrounds; I don’t like that look so I don’t use them. Subject Placement: Once you’ve established when your location has great backlight you need to place your subject(s) so that their heads are against the light in the background. This creates not just visual interest, but also separation of your subjects from the background. I do whatever it takes to place my subjects against the light. If when they’re sitting I have no backlight, I’ll stand them. This is why we usually bring our posing rocks on outdoor sessions—to elevate the group. With our rocks we can combine people sitting and standing without their heads being too far apart. In this example below we placed the young lady on the top of a picnic table to get her layered against the best part of the background. As usual should you have any questions please don’t hesitate to ask…’Til next week.